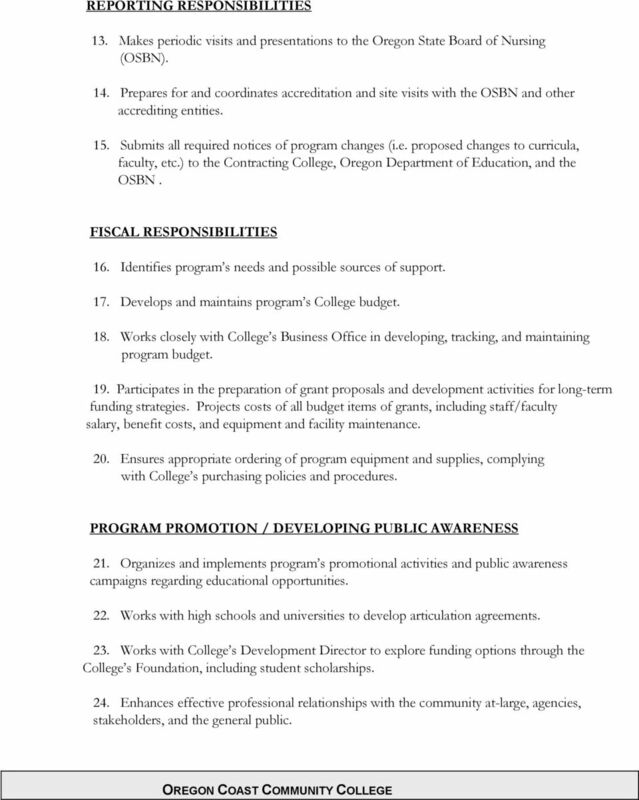 Download "OREGON COAST COMMUNITY COLLEGE POSITION DESCRIPTION"
3 3. 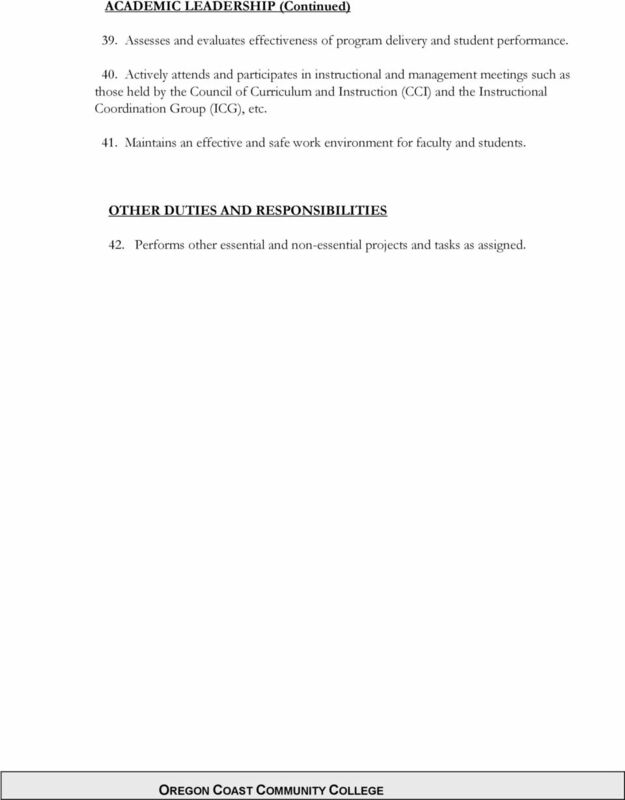 PRINCIPAL DUTIES - The following represent the major duties of the position, however they are not intended to be all-inclusive. The College reserves the right to change, reassign, or combine job duties at any time. PROGRAM DEVELOPMENT 1. 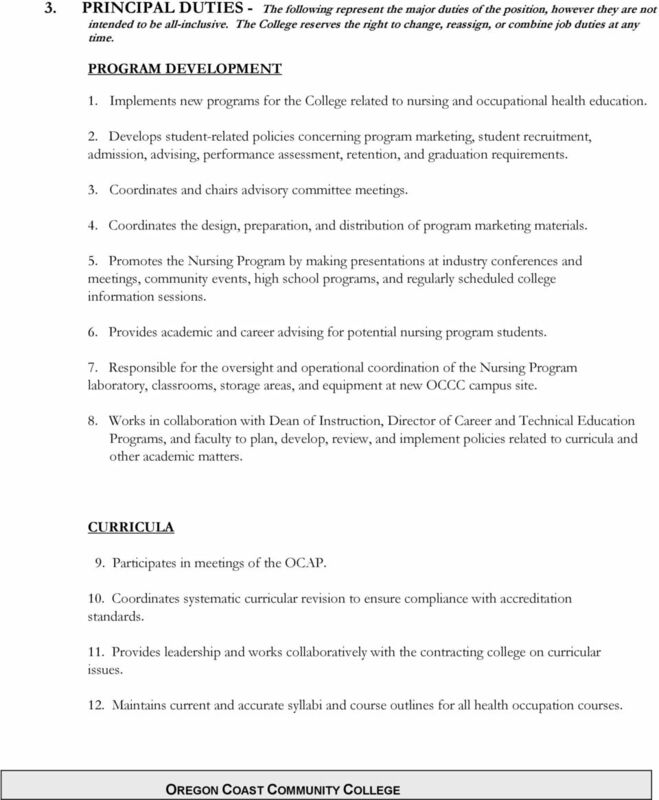 Implements new programs for the College related to nursing and occupational health education. 2. Develops student-related policies concerning program marketing, student recruitment, admission, advising, performance assessment, retention, and graduation requirements. 3. Coordinates and chairs advisory committee meetings. 4. Coordinates the design, preparation, and distribution of program marketing materials. 5. Promotes the Nursing Program by making presentations at industry conferences and meetings, community events, high school programs, and regularly scheduled college information sessions. 6. Provides academic and career advising for potential nursing program students. 7. Responsible for the oversight and operational coordination of the Nursing Program laboratory, classrooms, storage areas, and equipment at new OCCC campus site. 8. 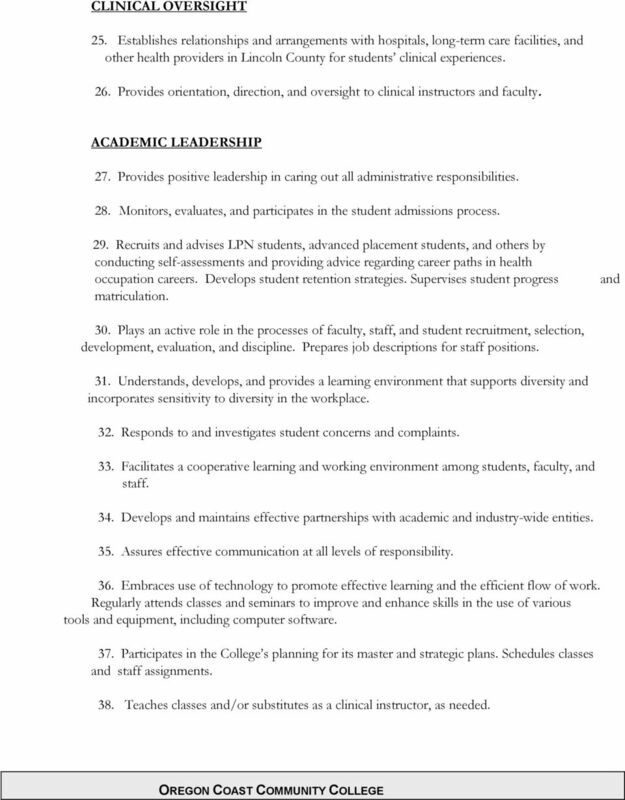 Works in collaboration with Dean of Instruction, Director of Career and Technical Education Programs, and faculty to plan, develop, review, and implement policies related to curricula and other academic matters. CURRICULA 9. Participates in meetings of the OCAP. 10. Coordinates systematic curricular revision to ensure compliance with accreditation standards. 11. Provides leadership and works collaboratively with the contracting college on curricular issues. 12. Maintains current and accurate syllabi and course outlines for all health occupation courses. 4 REPORTING RESPONSIBILITIES 13. 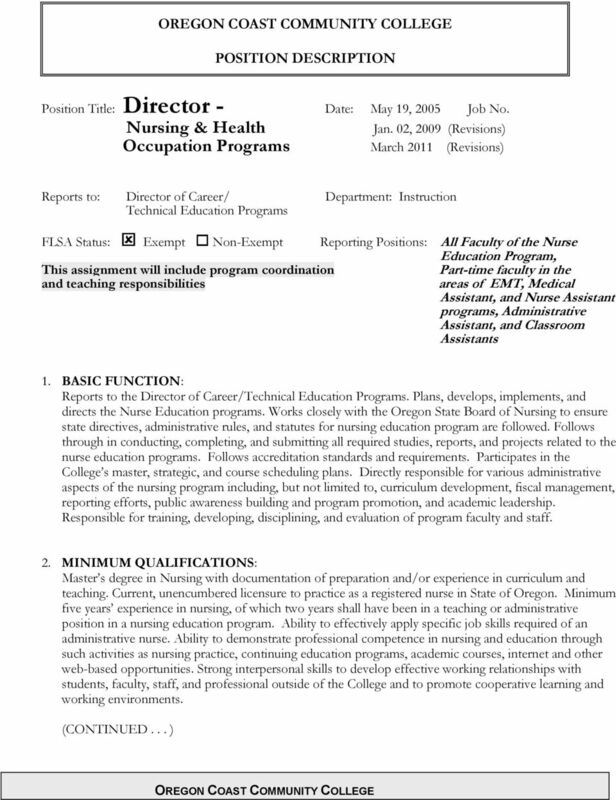 Makes periodic visits and presentations to the Oregon State Board of Nursing (OSBN). 14. Prepares for and coordinates accreditation and site visits with the OSBN and other accrediting entities. 15. Submits all required notices of program changes (i.e. proposed changes to curricula, faculty, etc.) 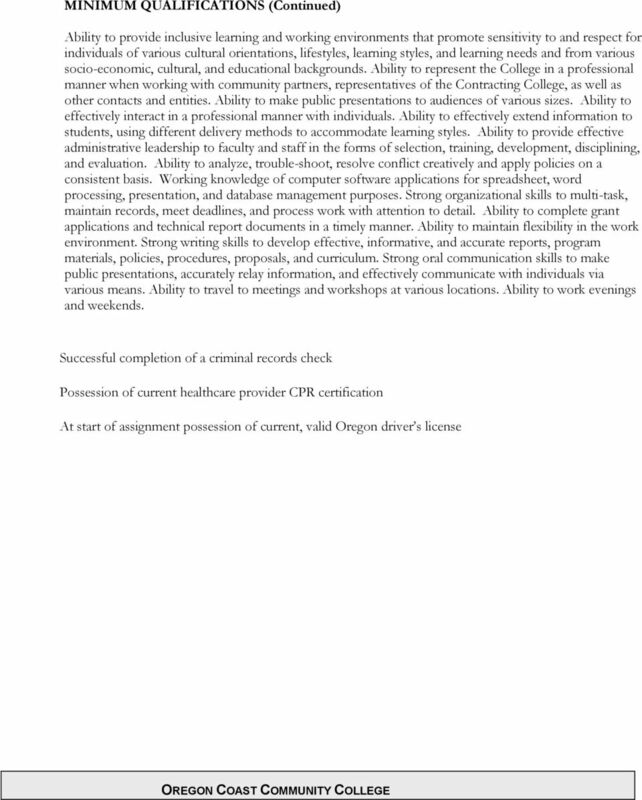 to the Contracting College, Oregon Department of Education, and the OSBN. FISCAL RESPONSIBILITIES 16. Identifies program s needs and possible sources of support. 17. Develops and maintains program s College budget. 18. Works closely with College s Business Office in developing, tracking, and maintaining program budget. 19. Participates in the preparation of grant proposals and development activities for long-term funding strategies. Projects costs of all budget items of grants, including staff/faculty salary, benefit costs, and equipment and facility maintenance. 20. Ensures appropriate ordering of program equipment and supplies, complying with College s purchasing policies and procedures. PROGRAM PROMOTION / DEVELOPING PUBLIC AWARENESS 21. Organizes and implements program s promotional activities and public awareness campaigns regarding educational opportunities. 22. Works with high schools and universities to develop articulation agreements. 23. Works with College s Development Director to explore funding options through the College s Foundation, including student scholarships. 24. Enhances effective professional relationships with the community at-large, agencies, stakeholders, and the general public. 5 CLINICAL OVERSIGHT 25. Establishes relationships and arrangements with hospitals, long-term care facilities, and other health providers in Lincoln County for students clinical experiences. 26. Provides orientation, direction, and oversight to clinical instructors and faculty. ACADEMIC LEADERSHIP 27. Provides positive leadership in caring out all administrative responsibilities. 28. Monitors, evaluates, and participates in the student admissions process. 29. Recruits and advises LPN students, advanced placement students, and others by conducting self-assessments and providing advice regarding career paths in health occupation careers. Develops student retention strategies. Supervises student progress matriculation. and 30. Plays an active role in the processes of faculty, staff, and student recruitment, selection, development, evaluation, and discipline. Prepares job descriptions for staff positions. 31. Understands, develops, and provides a learning environment that supports diversity and incorporates sensitivity to diversity in the workplace. 32. Responds to and investigates student concerns and complaints. 33. Facilitates a cooperative learning and working environment among students, faculty, and staff. 34. Develops and maintains effective partnerships with academic and industry-wide entities. 35. 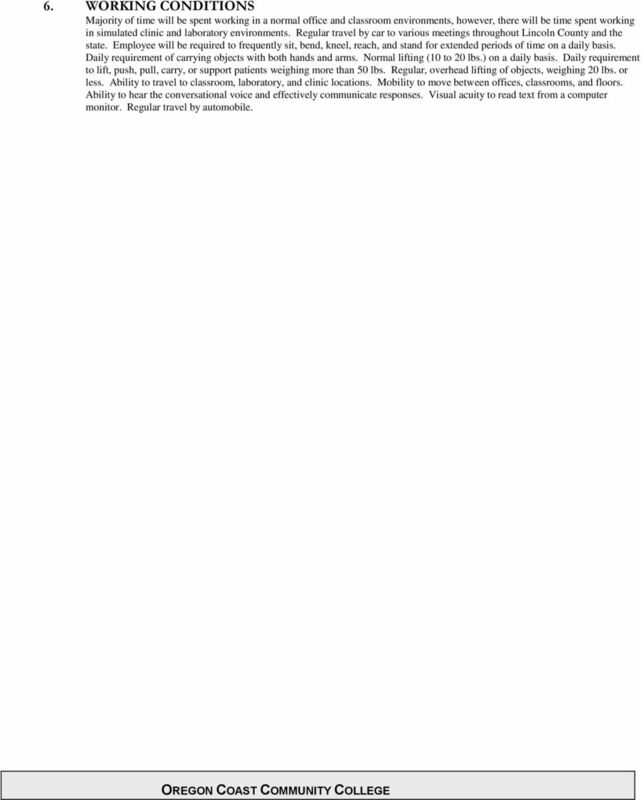 Assures effective communication at all levels of responsibility. 36. Embraces use of technology to promote effective learning and the efficient flow of work. Regularly attends classes and seminars to improve and enhance skills in the use of various tools and equipment, including computer software. 37. Participates in the College s planning for its master and strategic plans. Schedules classes and staff assignments. 38. Teaches classes and/or substitutes as a clinical instructor, as needed. 6 ACADEMIC LEADERSHIP (Continued) 39. Assesses and evaluates effectiveness of program delivery and student performance. 40. Actively attends and participates in instructional and management meetings such as those held by the Council of Curriculum and Instruction (CCI) and the Instructional Coordination Group (ICG), etc. 41. Maintains an effective and safe work environment for faculty and students. OTHER DUTIES AND RESPONSIBILITIES 42. Performs other essential and non-essential projects and tasks as assigned. 8 6. WORKING CONDITIONS Majority of time will be spent working in a normal office and classroom environments, however, there will be time spent working in simulated clinic and laboratory environments. Regular travel by car to various meetings throughout Lincoln County and the state. Employee will be required to frequently sit, bend, kneel, reach, and stand for extended periods of time on a daily basis. Daily requirement of carrying objects with both hands and arms. Normal lifting (10 to 20 lbs.) on a daily basis. Daily requirement to lift, push, pull, carry, or support patients weighing more than 50 lbs. Regular, overhead lifting of objects, weighing 20 lbs. or less. 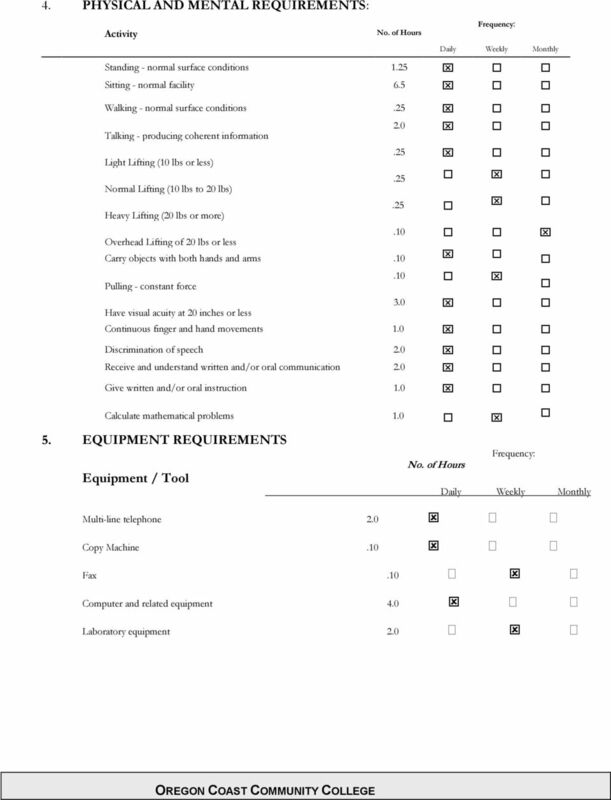 Ability to travel to classroom, laboratory, and clinic locations. Mobility to move between offices, classrooms, and floors. Ability to hear the conversational voice and effectively communicate responses. Visual acuity to read text from a computer monitor. Regular travel by automobile. The City of Miami Gardens is Drug-Free Workplace. All applicants who are selected for employment may be subject to substance screening.